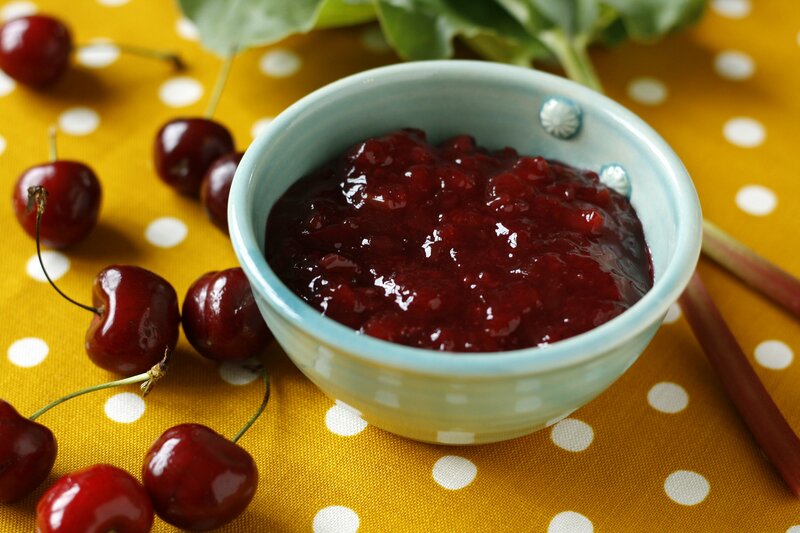 Yesterday I picked up some ripe, beautiful cherries at the supermarket and decided I needed to continue my successful jam-making run that started a few months back (Blood Orange Marmalade, Strawberry Lime Vanilla Jam). 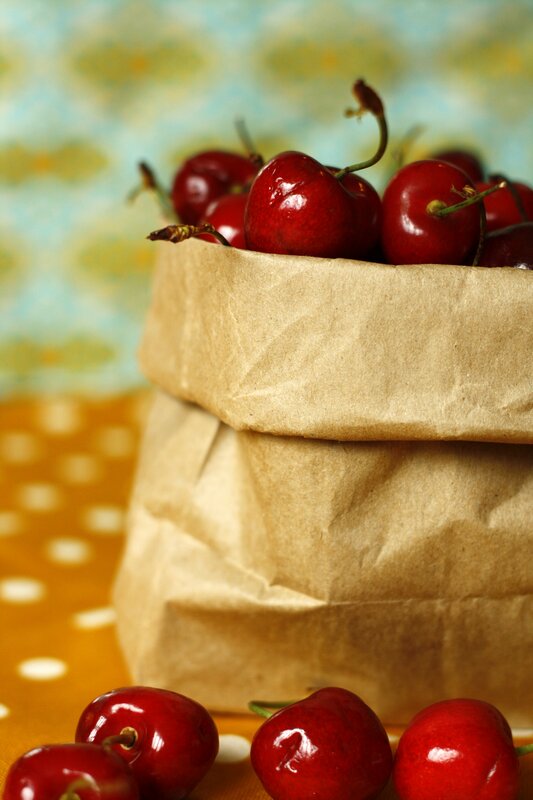 Many years ago I loved to sit down with a paper bag filled to the brim with fresh cherries and polish off the whole thing. Unfortunately things have changed since then. Since my last pregnancy I’ve acquired a fruit allergy and am unable to eat most fruits raw. It was a hard adjustment for this fruit-lover but the little boy I got in return was well worth it. So now I have to enjoy apples, peaches, pears, plums, strawberries and cherries (to name a few) cooked. Usually the thought of cooked fruit brings images of old people in hospital beds but I’ve found some great ways to enjoy my favorite fruits over the years. So how did this jam almost kill me? Well, I pitted all the cherries, washed my hands with hot water and soap 5 times and an hour later touched my eyes. And this my friends turned me into a swollen-faced mess. My face puffed up to double it’s normal size, my eyes were swollen shut and welts appeared. My kids ran away screaming in terror. I actually heard my son ask my husband in a traumatised voice “will mama ever go back to normal?”. Luckily I had some antihistimines close by. The jam ended up turning out so delicious that it was almost worth it. Almost. 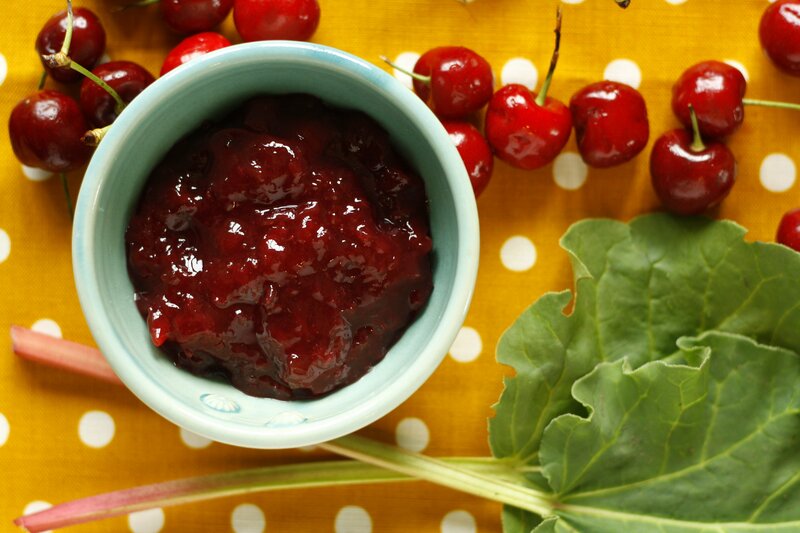 I browsed through the internet for a good cherry rhubarb recipe and came across this one on the apt 2b site (amazing recipes on this blog). In the end I couldn’t really manage all the steps that the recipe calls for (due to suddenly being blind!) so I literally dumped approximately 300g of chopped rhubarb with 200g sugar into a large pot and let it simmer for about 10 minutes. I then added about 600g chopped pitted cherries, another 2500g sugar, a few tablespoons of lemon juice and a few apple quarters. I let it simmer for another 15-20 minutes before adding some fresh lavender tied in cheesecloth (the recipe didn’t call for it but I thought it would be a nice addition) and a few tablespoons of powdered pectin. I let it simmer a further 5-10 minutes and then removed the apple pieces and lavender bundle. Then I went and soaked my head in cold water for half an hour to try and get the swelling down while the jam cooled. The jam cooled but the swelling didn’t go down. I think I lucked out because the jam turned out perfectly. It’s sweet with a slight tart and perfumey aftertaste. My family loves it and after breakfast one jar was almost finished. I take that as a compliment. I used to practically live on fresh fruit. And living in Italy and seeing all this wonderful fresh produce is quite tortuous. But things could be worse, right? At least I can still eat grapes, melon, banana and pineapple (for now!). That’s a real jam to be in – and DANGEROUS. Poor you, it must be so hard to turn down fresh cherries. What about ice cream? Can you eat strawberry ice cream? Yesterday I made a cherry pie with fresh cherries … mmm so delicious!! Cherry pie is one of my favourites. I haven’t had it in years. And now I’ll have to make it because I can’t stop thinking about it! I guess I’ll have to wear goggles, gloves and any other sort of protective clothing I can get my hands on. Whoa glad you’re de-puffed and back to normal! That is one serious fruit allergy! I’m not totally de-puffed yet but at least my son can look me in the face now. That’s an improvement from last night. Looks like a great recipe! You are so daring – with your allergy that bad – to work with fresh fruit…so kudos to you – for sharing this nice recipe and I can’t wait to try it. It’s being added to my list of recipes to make! Hope you are better now. My daughter has developed a fresh fruit allergy. She’s also allergic to some raw veggies too. So I feel for you. She turns sullen at the mere mention of strawberries saying, “It’s so unfair! I LOVE strawberries.” Sadly they don’t love her back. Once, I chopped a jalepeno pepper. I washed my hands a gazillion times and everything seemed fine. That was until the next morning when I went to put in my contacts. ZOMG! Hot searing burning pain. I guess I still had some oils on my hands when I took them out the night I chopped it up. 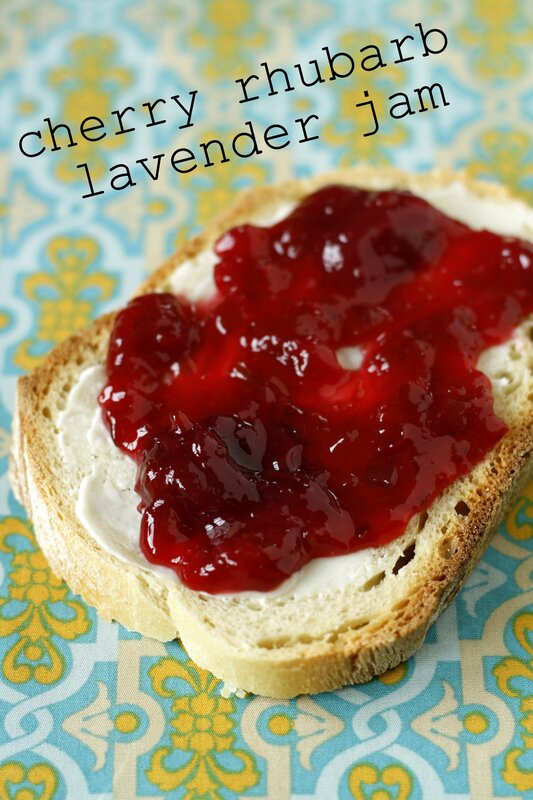 The jam sounds delicious. I can’t wait to give it a try! Oh I feel so bad for your daughter. It’s difficult especially at this time of year when all these delicious fruits are in season. And everytime you go anywhere someone is serving something with strawberries or cherries on top. And that jalapeno pepper in the eye story made my eyes water just reading it. Ouch.